This was the third show we produced from Microsoft’s Future Decoded event and the first interview was with Scott Allen, Microsoft UK CMO who was returning to the csuite podcast, having previously chatted with us on Show 45 from the MOI Distrupt Forum talking about Building a Modern Marketing Organisation of the Future and then from Cannes Lions where we discussed Data & Creativity. This time, Scott was joined by Edd Atcheson, Adobe EMEA’s Lead Digital Strategist. Scott said that the atmosphere at Future Decoded was electric and that over 24,500 people had registered for this year’s event. He thought that one thing that had worked very well was the bringing together of business and technical audiences, but he really liked being able to see digital transformation and what it means come to life and how it was changing people’s lives as well as changing organisations too. Do you have a team that can help you become modern marketters and if not, can you give your team the necessary skills? What processes do you need to be successful? Scott and Edd’s presentation is available to download from the Future Decoded website. Scott said that there are a number of things they look at to help drive transformation within the marketing function. These including having the right content strategy, how you show up online, what your social strategy is, etc., but he said what he has been talking a lot more about recently is data and insight and how this should be the muscle of marketing moving forward. Scott wants to see data and insight playing a key role in the marketing that you do. He added that hindsight is important and that marketers are great at reporting on what they do, which of course you need to do to understand what worked did and didn’t work, but he is now talking more about insight and foresight. Scott said that marketing departments are traditionally rich on data, but poor on insight, which is why his data and analytics teams are so important as they can interpret that data and give you the insight you need to start making the right marketing decisions. When talking about foresight, he means looking at what have we done that has been successful in the marketing we do and could we repeat it with other customers. Adobe and Microsoft have a close relationship and Edd explained that the companies have been working together for years, but now they are formally creating a partnership at every level. Adobe are moving their cloud platforms onto the Microsoft Azure platform and together with a common data model they can exchange data. They also have the partnership of Microsoft Dynamics, Power BI and Adobe’s Experience Cloud working all together on point to point integrations at the moment and in the future seamlessly. Scott said this partnership is about how all those technologies that Edd mentioned come together to deliver powerful, comprehensive experiences that they want to give their customers. He added that Microsoft and Adobe will begin to appear together at other events and in customer announcements that they make. In relating it to a client’s business, Edd explained that it will enable a marketer to analyse the data themselves and if they need help, they can go to the data team for a deeper insight. They might have some ideas about the hypothesis but can then formulate a test plan to test that hypothesis, but finally, they will be able to change a customer experience within hours. He said it should be rapid testing, continual innovation. 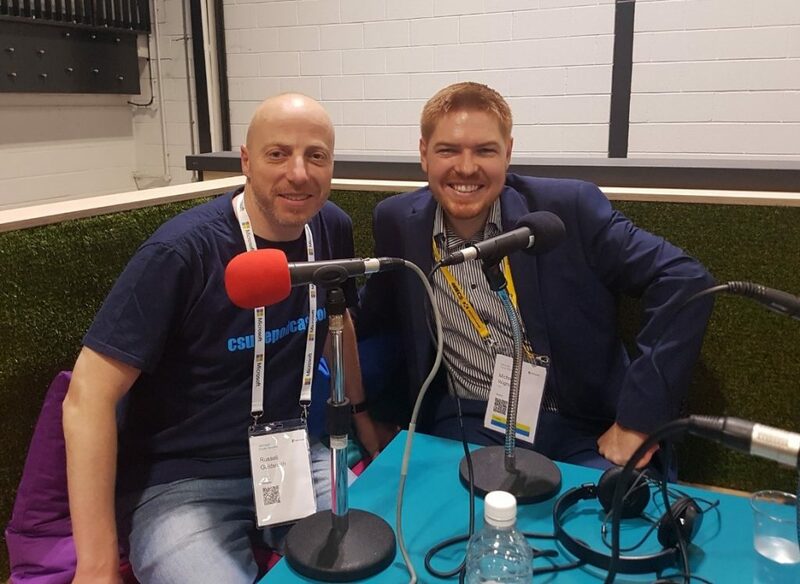 In the second interview of this episode, we caught up with Microsoft UK’s Chief Technology Officer, Michael Wignall who had just finished his talk on ‘Tech Trends Decoded’. Michael said that it was a high level introductory talk where he was positioning a number of technologies in a real-world business context, discussing the 4th Industrial Revolution, and how these trends impact organisations and the customers they serve. Michael said that when people think of the 1st Industrial Revolution, they think of machinery replacing horse power and people power and how it dramatically impacted people’s lives and recognise it as a monumental shift. He now believes that what we are doing in the 4th Industrial Revolution is very similar, but in fact will have a bigger shift in how we work, in terms of the tools we use and how technology can enhance our work. However, he added that this is actually impacting faster in our consumer lives than in the business world. Michael’s presentation covered a lot of technology including bots, blockchain, machine learning, cyber, big data, IOT, Cloud and quantum, but one of the best real-world examples of this technology is the work they have done with Dixons Carphone using a combination of bots and artificial intelligence to augment the human work. In this instance, previously a person could access their shopping cart online, look at recommendations and view specifications of what they wanted, but when they went instore this information did not follow them. Now using bots online on their web portal, they were able to capture the data, then artificial intelligence could supply customers with suggestions, based on their buying habits, and all this data is available to access instore. 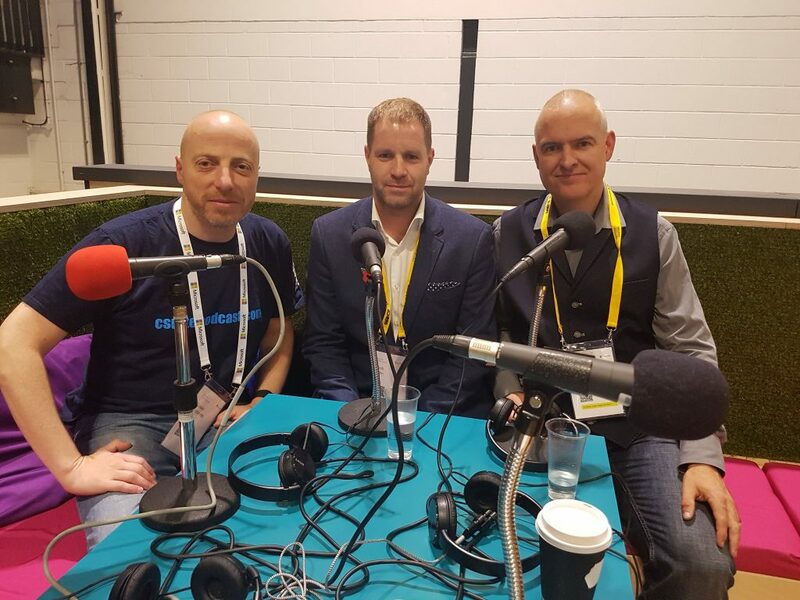 Michael said that the biggest take away for listeners was that a lot of the tech trends he spoke about are available today, not in 18-24 months’ time, i.e., you can take Vision APIs, bots, blockchain or the advances in cloud and big data and use them in your daily life and Microsoft try to democratise that and make it all easy to use. However, looking further out, perhaps over the next five years, he feels that the next big tech trend will be Quantum. Michael believes Quantum will fundamentally change the way we think of the world. He said the best analogy to bring it to life is in classical computing solving a maze, where it tries each path in turn to get to the centre, until it finds the way, whereas quantum computing can try all the possibilities simultaneously, so reaching a solution much faster. Michael feels it will help to find a solution for global warming, or looking at the human genetic process and precision medicine and finding better ways to do crypto security. 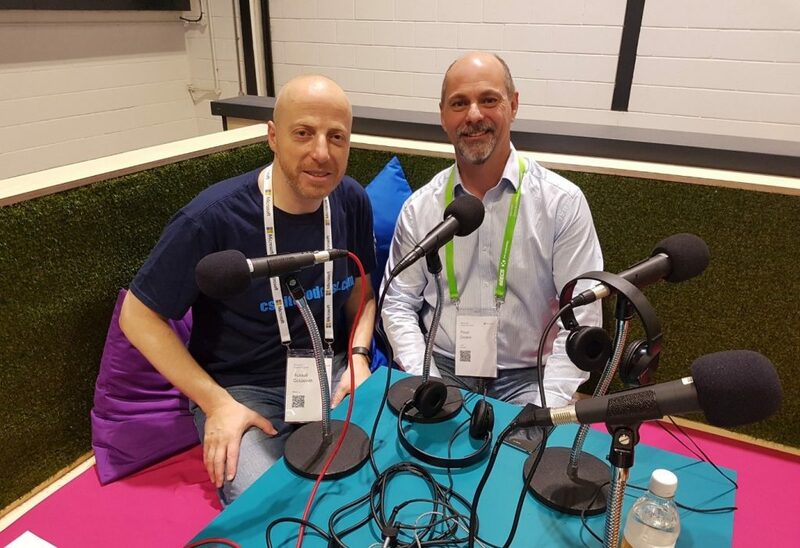 In the third part of this episode, Russell spoke with Chris Bishop, Laboratory Director at Microsoft Research Cambridge about the topic of machine learning. Chris was recently elected as Fellow to the Royal Society, something he said was an incredible honour and privilege as the Royal Society, at over 350 years old, is the oldest scientific body that’s still in operation. Chris said that the greatest honour was signing the Charter book, which has also been signed by Charles II, Einstein, Newton, Darwin and all the scientific greats! As for Microsoft Research Cambridge, 2017 saw it celebrate its 20th anniversary. When Chris looks back on past 20 years, he says that progress in AI and Machine Learning, particularly in the last 5 years, has been faster than he anticipated. He began his career in physics, but 30 years ago he made a radical decision to move into computer science, due to the new techniques at the time called Neural Networks. Back then, Chris thought this was the future of computing, and in a way, he said it has turned out that way, but much later than he originally expected! One area of Machine Learning that Chris is particularly excited about is in healthcare, where his team are working on a project called InnerEye. It is a research project using computer vision AI techniques to help radiation oncologists to analyse medical images prior to radiation therapy planning. Chris explained that over the age of 60, around half of us will get cancer, and half of those will need radiation therapy, which needs to be planned. This means working out the three-dimensional position, shape and boundary of the tumour, in order that the radiation can be directed, so as to cause as much damage to the tumour as possible but as little damage to all the vital organs and healthy tissue. He said that this is a process that is very time consuming, that takes the oncologists several hours to do. However, machine learning can cut down the time this process takes to just a few minutes, allowing the oncologist to devote their skills to things much better done by a person. Chris is increasingly working in healthcare, where he said the costs are growing and is becoming a financial burden on society. He feels the healthcare process is ready for digital transformation, specifically for a data driven AI centric approach and he hopes to see a revolution in the industry over the next decade, where the patient is in the centre, and the process is driven by data, so that your healthcare becomes an ongoing daily process and not just something that happens every few years when you become ill and go to hospital. Looking to the next 20 years of Microsoft Research Cambridge, Chris thinks there will be tremendous progress in machine learning in many applications and he believes healthcare will be one of the most important areas, but not the only one. The background for this is the long-term aspiration about true AI, which has been rejuvenated by the promise of machine learning. The aspiration still seems to be many decades away in that we can’t yet get a robot to climb stairs or hold a proper conversation with a machine, but perhaps in the next 20 years we will start to see some progress on the really deep challenges around true intelligence. 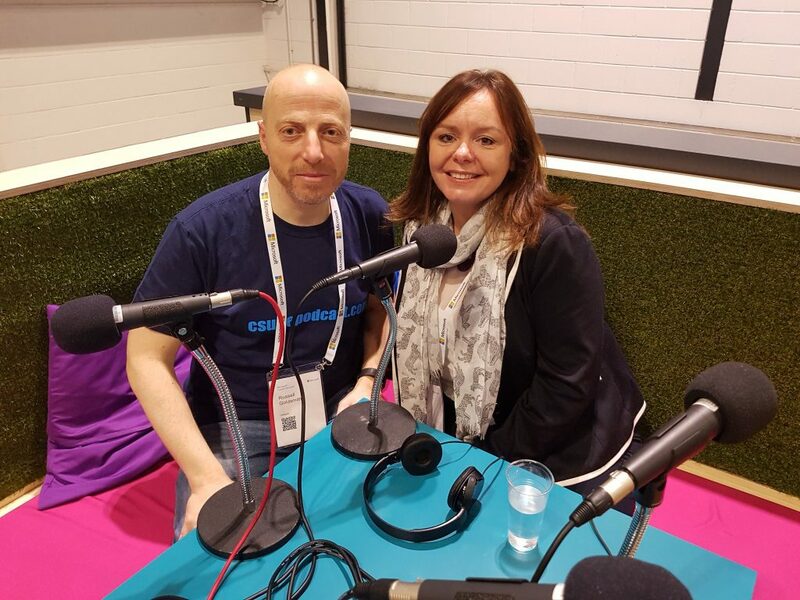 In Part 4 of the show, Russell spoke with Peter Deane, Vice President of Mixed Reality and Virtual Reality developers VISR, who were at Future Decoded to launch VERTX, a very exciting mixed reality platform. VERTX makes it possible for global design teams to work across multiple locations on multiple devices and collaborate on live design projects in real time while standing in the space you are designing, and Peter believes there are many possibilities for the technology. One area VERTX has worked well in is manufacturing, where VISR are working with a high-quality cardboard manufacturer that prototype high quality stands. Peter said that the manufacturers have to go through a very physical two-dimensional process to design the stands, that is labour and material intensive. However, by using mixed reality, they can cut down the cardboard wastage and reduce the design time by using holographic technology, such as Microsoft HoloLens. Another example that Peter gave was is in the retail industry, where VISR have recently worked with Mars Gulf, helping them to design store shelves. In this instance, they used planogram tools to design category placement on the shelves, which again, has until now been a two-dimensional and labour-intensive process that has traditionally been difficult to get it right. Peter questioned that, as we live in a 3D world, why do people work with two-dimensional tools. They have therefore developed a prototype, which allows multiple people to work together on a shop layout and shelving design, where they can experiment in a holographic environment. It is quick to set up and is efficient from a labour perspective and users can get a much better idea of what things could look like in the real world by move things around. Peter added that they also have eye tracking technology, which improves the research process. For example, when they design shop shelves, they have to physically build them, and then bring in consumers and ask them to shop, after which they ask lots of questions about the experience. It’s a very subjective process and Peter said that often, people don’t want to tell you what you want to hear! However, eye tracking technology allows the retailer to gather real evidence in what people were looking at and their behaviour. It brings in layers of analysis of the surrounding environment and making use of it is an incredibly powerful possibility. VISR are recent graduates of the Microsoft Mixed Reality Partner Programme, which Peter said is a really tough programme to get on to. VISR’s engineers had to spend three months with the HoloLens Lens engineering team in the UK and were then vetted to join the programme. Finally, Peter believes that inclusivity is a big opportunity for mixed reality technology and that last year, VISR worked with Microsoft and CASPA, a charity for people on the autism spectrum. He said that they took the technology to a children’s camp and that the way the children interacted and used the technology, which amazed the organisers. It allowed them to interact and collaborate with other people in a way they have never been able to previously. In Part.5, Russell spoke with Angela Evans, Microsoft’s Office Business Group Lead UK, on the topic of The Modern Workplace. Angela explained that a blend of workstyles changes the workplace as people are working longer. For example, she said that in 2020, they expect 50% of workers to be millennials, who seek to work differently. They work more collaboratively and need to be able to connect with other people. They also want to work more remotely, any time, any place so it is important they have the tools and the digital workspace to allow this. Angela added that employer expectations are also changing – there is a shift away from the daily routine tasks. Everyone is expected to be more creative and this needs an open flow of information, which can lead to security risks of data. Composition of the workforce – how many millennials do you have and how do you want the composition to evolve over time? What workstyles to millennials prefer and the environment that they are their best in. Where are the teams geographically located – how do they come together to collaborate? What type of access to information do they need? The Outer loop – a broad range of people across an organisation – a broadcast message where she wants input from a number of different sources. Here she recommended using Yammer. The Inner loop – people you work closely and co-create/collaborate with on projects – and in this instance, she recommended Microsoft Teams. To provide an example of how this all comes to life, Angela talked about Aston Martin, an organisation with multiple sites and so need to improve collaboration across them. They use Power BI to advance business intelligence. Andrew Palmer, President & CEO, Aston Martin Lagonda said that there has probably been more data produced in the business in the last year than in the past 103 years that proceeded it, and Angela added that the wealth and richness of insight is amazing. She said that Aston Martin also wish to energise the creativity of their employees and that close collaboration requires mobility, but not at the expense of security. Praveen Maloo, Product Evangelist for Microsoft Teams. 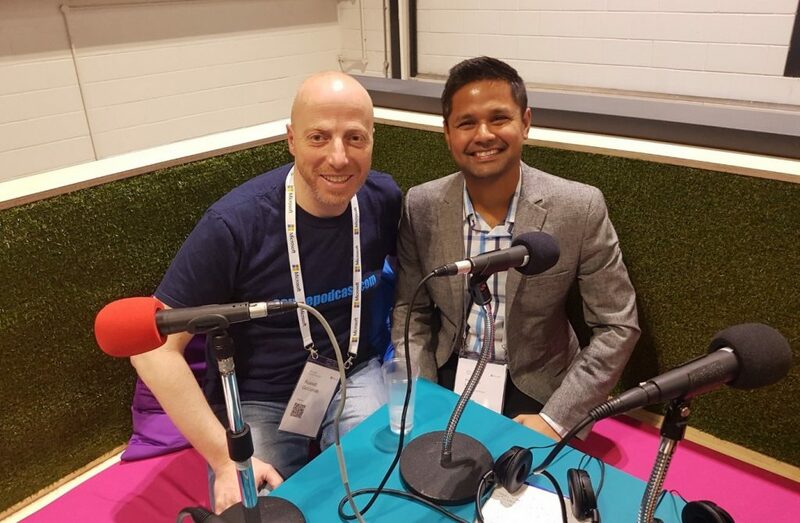 For the final interview from Future Decoded, Russell caught up with Praveen Maloo, Product Evangelist for Microsoft Teams, who had made the trip to the conference from Seattle. As Praveen explained, Microsoft Teams is a collaborative hub bringing everything you need for teamwork into one place, including conversations, files, apps and tools like video calls and web conferencing. It is part of Office 365, so it integrates with all the Microsoft Office apps (Word, PowerPoint, Excel etc. ), but as the system is a very open platform, it also integrates with many third-party apps, such as Hootsuite or Asana, Trello of Smartsheet (for Project Management). In fact, Praveen said that they are working with 200 partners and growing. It therefore allows you to customise the platform as you see fit. Praveen said that there is increasing number of millennials starting work and for the first time in history there are five generations in the workplace who all have to collaborate using the technology of today. There are also many more mobile devices used and people want the ability to work anywhere, so the tools of yesterday do not meet the needs of today. This is why he said that Microsoft started to look at building a tool that takes account of the increasing social interactions and habits so that they can relate to their work tools as much as the ones they use in their personal space. To help avoid the issue of ‘Fear of Missing Out’ (FOMO) in a work environment, where people have to find a balance between the social side of work and staying focussed, Microsoft Teams helps by optimising notifications, using callout if the chat is specifically relevant to an individual when needed and not all the time. It’s also introducing AI, in that it can recognise previous conversations about a certain topic and notify you if it’s something you should be paying attention to. Parveen believes that there will be a cultural change if organisations use Microsoft Teams, as it radically changes the way people collaborate – it’s no longer about individual productivity but instead is about team productivity. He said that people [using Microsoft Teams] are collaborating in an open, transparent, and democratic digital environment. It therefore gives everyone a voice, a chance to collaborate and create, and raise awareness of what they are doing in the entire team.